Thursday, Jan 31; another glorious sail into Elizabeth Harbor, sadly though, officially out of the tropics once again. Another big wind event (am I sounding like a broken record or what?) was due in Friday night so we opted to try out the very protected anchorage behind Crab Cay, called Red Shanks. In reality Red Shank Cays are just two small cays off the southern tip of Crab Cay. Much of the anchoring spots are behind Crab and boats drawing less than 5 ft can get in at mid-tide or better. In 2009 construction was halted on a 5-star resort and marina village planned for the northern portion of Crab Cay. Another Bahamian Twilight Zone episode where the plug gets pulled and the area looks like the workers will be back at it any day. 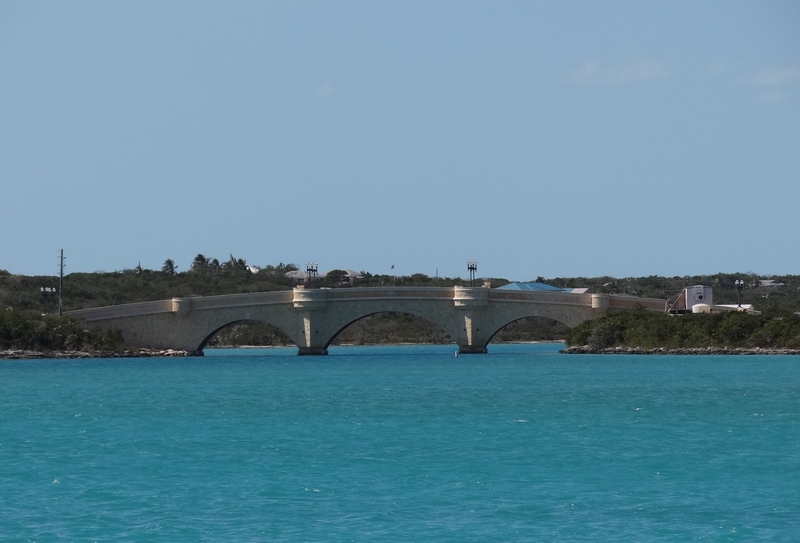 An unusually lovely bridge was built connecting Great Exuma to Crab Cay and now all it does is block the way for any boat needing more than 15ft of height. Back aboard, we received a visit from one of the handful of other boats anchored behind Crab Cay. Oh, this was looking good; a man in a drysuit with a large bucket in his sturdy, chap-covered dinghy. Guess what he loves to do and is very good at? When they have more than they need or want, the excess is given away and we were happy to receive “dinner for two” from Steve on Little Sister. He showed Russ how to separate the tail from the body; next question, “Would you like any conch?” Well, yes, but we don’t know how to clean them- and we do know it’s a bit of a process. We’d have to pass. Friday early evening the wind did her thing, causing several boats anchored off Volleyball Beach to drag. Tucked in tight usually without enough scope along with a change in wind direction makes those anchors pop out, sends dinghies to the rescue and hopefully you don’t get to rub fiberglass with your neighbor! Heard the wind topped out around 30kts but we never saw more than 23kts- which felt only like 15kts. Saturday was a big baking day. We took an olive oil baguette over to Little Sister and left with “The Conch Book” and a date to learn how to clean the conch still floating in a mesh bag off their boat. Oh boy. 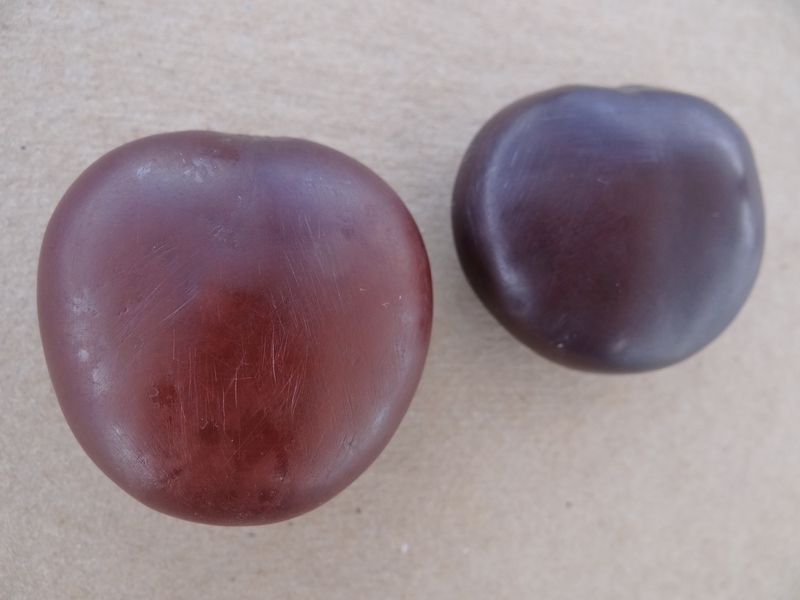 Sunday I worked on sanding some sea hearts, which turned out to be easier than cleaning conch! Steve told us to bring sharp knives and large Ziplocs. Newbies at this process, we imagined it taking place on the stern, but as we approached our instructors jumped in their dinghy and off we went… to the perfect conch cleaning place and sheltered from the wind too! Fast learners- for sure our middle name. 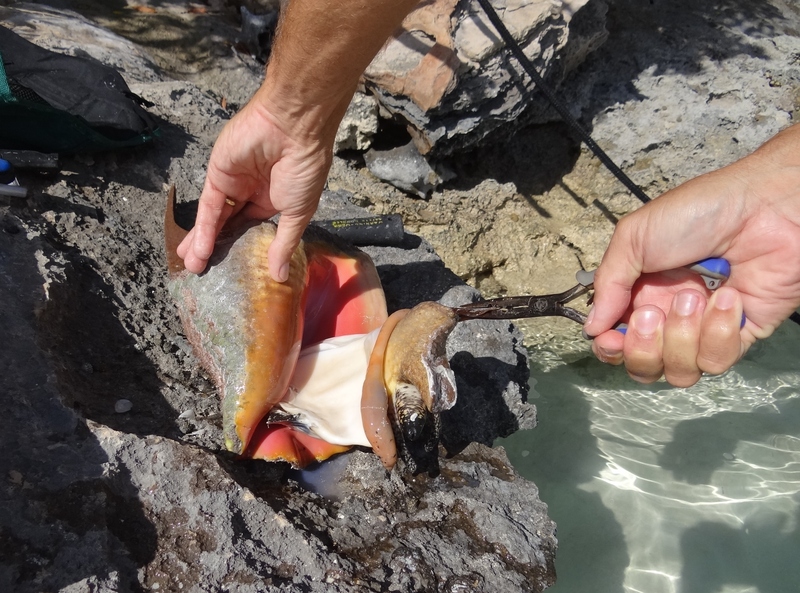 Steve explained how to determine apprx conch age then showed us how to extract the conch. 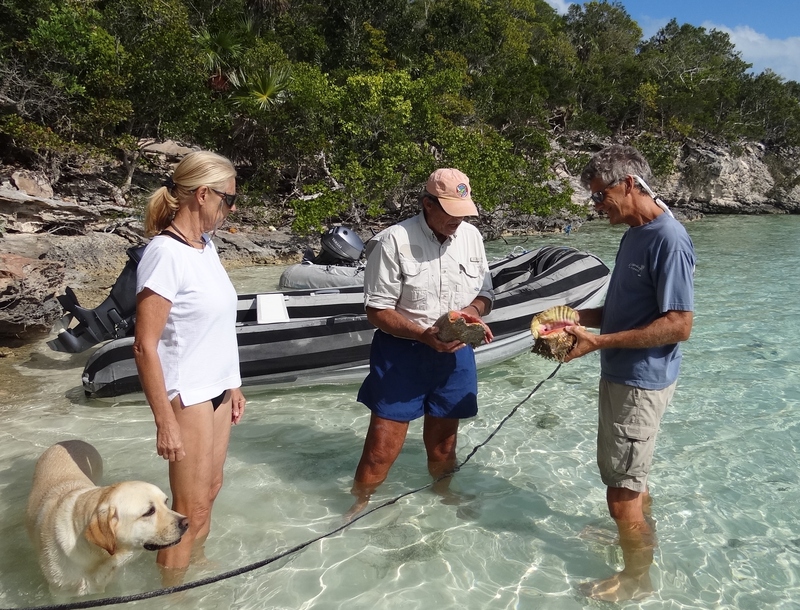 Steve explains conch basics: how to determine approx age. The next step is a bit yucky and I’ll just leave it at that. While Russ did that I removed the skin, and then when we had a few ready Steve showed me how to slice and pound the meat. 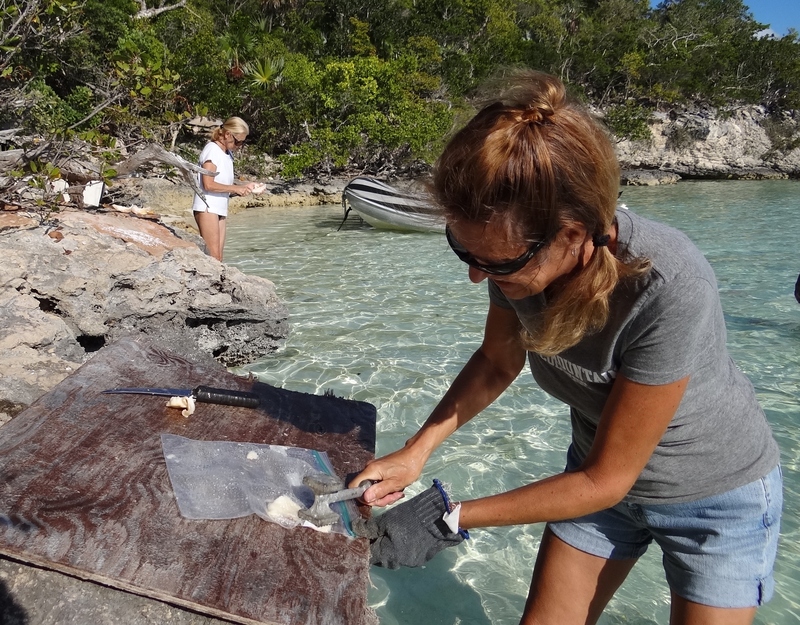 Janna stepped in to help skin and within two hours, 11 conch were processed and the meat filled a gallon Ziploc. Little Sister took a small amount and now I’ve got at least six meals in the freezer. 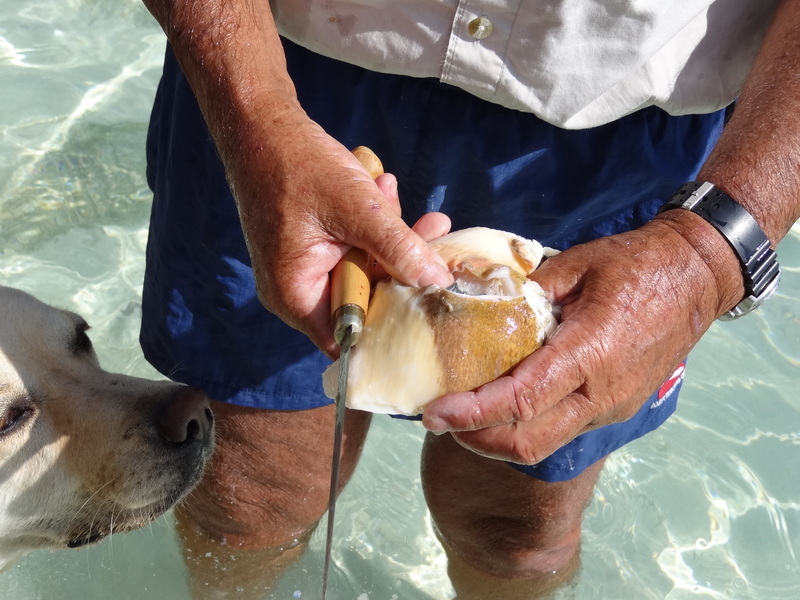 We couldn’t have been more thrilled; learned how to clean conch (not that diving down deep for any is in our future), made new friends and have enough conch to allow me to try some new recipes. How about Conch Cakes- a take on Crab Cakes- were very tasty with Old Bay, turmeric and thyme as the seasonings.